Mishima is near and dear to my heart. 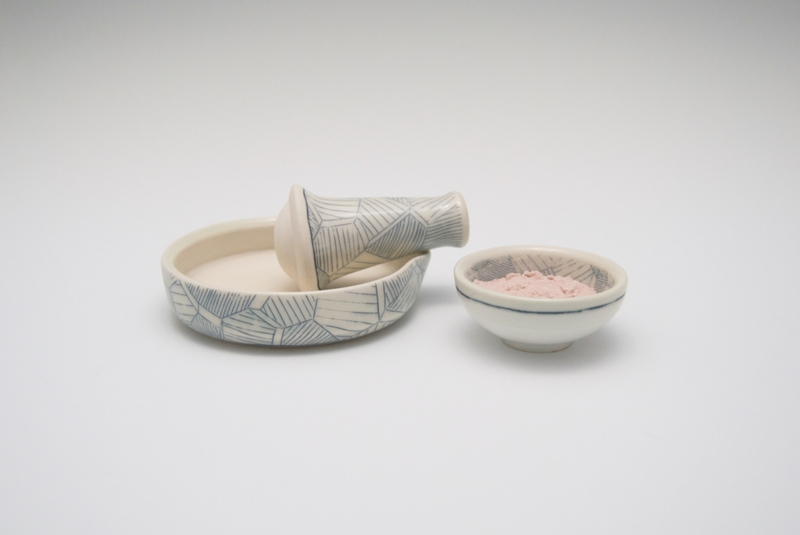 It was the first surface design technique that made me truly passionate about ceramics. I'd only been dabbling in clay for about six months when I first learned the process at a workshop. I spent the next three and a half years working almost exclusively with this thin, precision-carved inlay, and its basic principles influence even my non-inlaid work today. I carve each line of my mishima surfaces by hand, using a very sharp X-Acto blade to create the thinnest possible marks. Depending on the complexity of the design, this process can take several hours per piece. I then fill the lines with a blue/gray underglaze and remove the excess with a damp sponge, leaving color only within the carved lines. Ceramic artists often coat their work in a layer of wax before carving. While this makes the excess underglaze much easier to remove, I prefer to skip this step. Carving and sponging the porcelain surface directly allows me to eliminate most tactile traces of the cuts so that the work feels completely smooth when glazed. 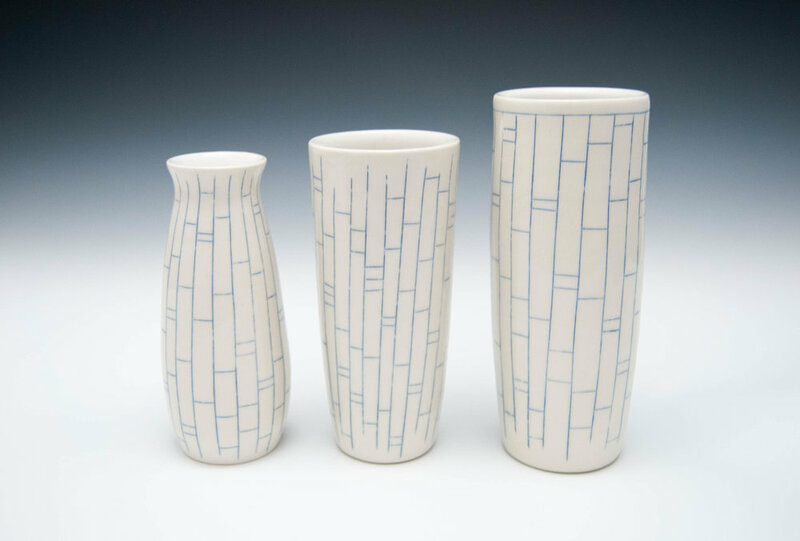 Mishima Collection II includes my wavy, architectural, and climb series, which all feature a traditional blue and white palette, sometimes accented by a runny blue glaze. At the risk of sounding corny, I found myself in Mishima. (At the risk of sounding even cornier, I stole that line from the movie Sabrina...except she said "Paris.") 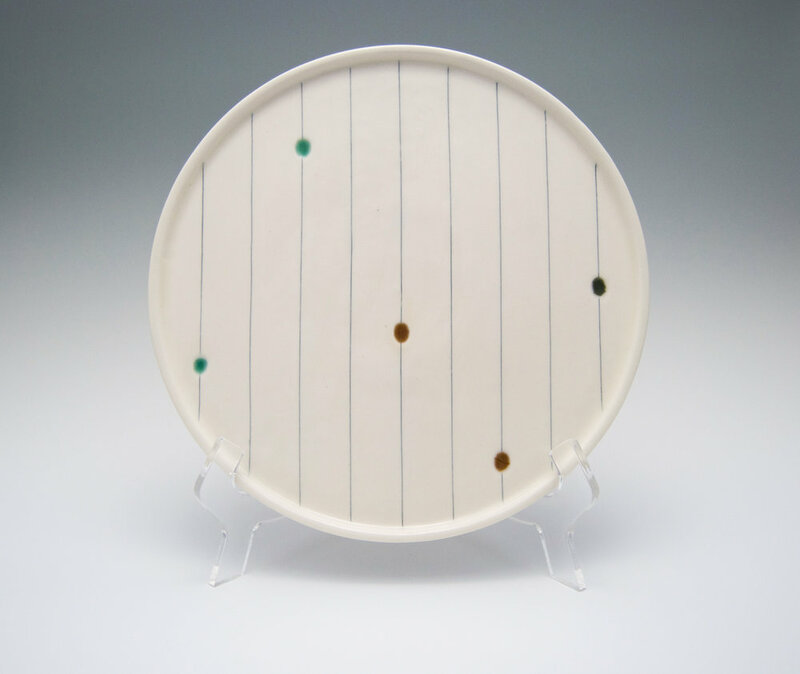 My first mishima collection was about two years after I started exploring this fine-lined inlay technique, and it was the first body of work I created that felt truly cohesive and me. I used the same hand-carved inlay processes described in collection II, but placed a strong emphasis on mid-century inspirations. 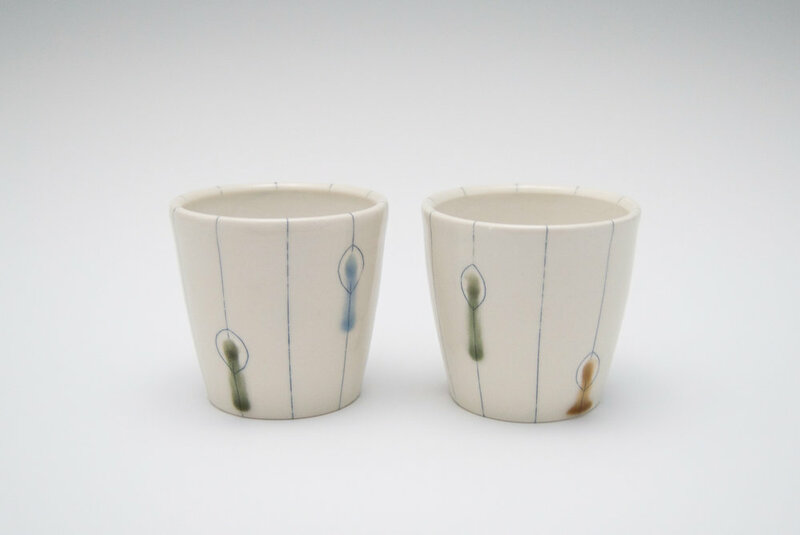 I paired minimalist, curvy forms with geometric patterns and fluid, jewel-toned glazes to create what I think of as an homage to my Swedish grandmother, whose Nordic mid-century home and aesthetic have long influenced my designs. 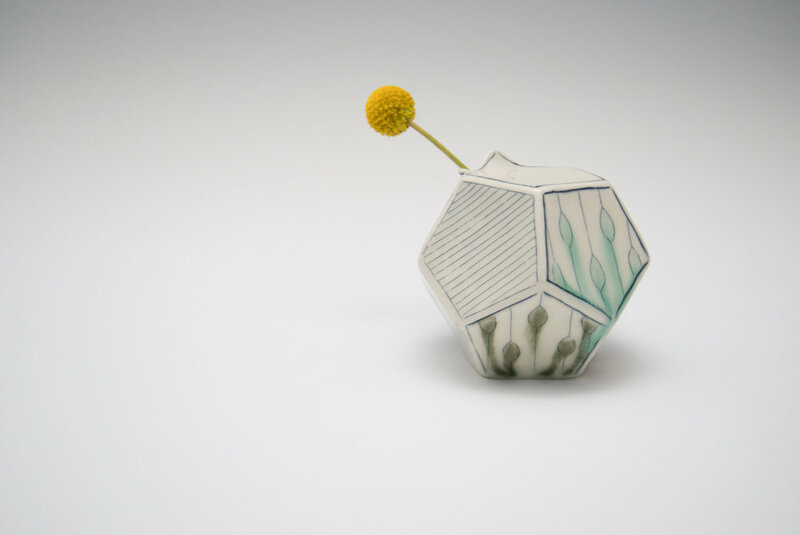 Mishima Collection I includes my stacked pentagons and flow dots series, along with an early version of the architectural series that also appears in collection II. Custom-mixed, highly runny glazes drip from the edges of the inlaid patterns or flow from deep recessed dimples carved into the surface.